P.L. Travers started writing about the fictional English nanny, Mary Poppins, back in 1933. Little did she realise, then, that this magical character would later inspire a Walt Disney animation movie and even later still…a hit theatrical musical by Cameron Macintosh. Strange to think that a story about a dysfunctional family, saved by the intervention of a helpful nanny, would prove to be so popular. I was lucky enough to see the original London musical on the 5th March 2005, at the Prince Edward Theatre, but I have also been lucky enough to see it more recently, when I took my Mother to see it this month. It was an amazing show – so magical that it was almost like being part of the magic. It caught the spirit of my childhood, so-much-so, that I have decided to see it again this evening at The Theatre Royal, Newcastle. The show, starring Zizzi Strallen and a wonderful supporting cast, has received rave reviews and I am not the least bit surprised. I also love the Walt Disney movie, starring the lovely Julie Andrews, that was released in British cinemas on the 23 December 1964. I wasn’t born then, but I do remember seeing it at the cinema with my parents. I loved the animation sequence with the penguins and the farmyard animals, which featured the amazing voice talents of Marnie Nixon. When it came to choosing characters for my 2005 calendar (can it really be that long since I designed that calendar? ), Mary Poppins was an outright choice for me. My good friend and teddy bear costumier, Jennifer Stephenson, created the marvellous outfit for one of my bears. I loved the work that she had put into the scarf and the cherries and flowers on her hat, bearing in mind the bear was rather small and fiddly to dress. 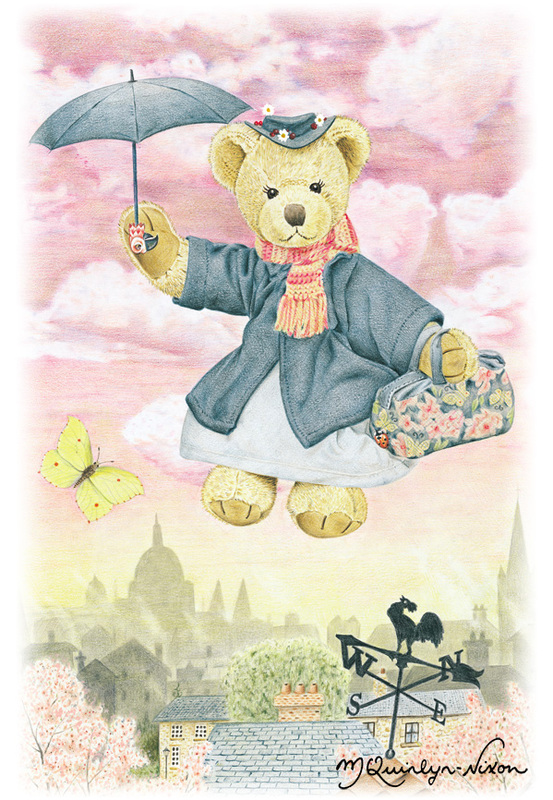 I featured one of my favourite scenes from the movie in my Bear-a-thought illustration; when Mary Poppins flies down towards her destination: No. 17, Cherry Tree Lane. I also wanted to give the impression of the smoky background of chimneys and part of a London skyline, which features so prominently in the movie. It’s the part of the musical which features classic songs such as ‘Chim Chim Cher-ee’ and ‘Step in Time’. I also had to feature The Little Old Bird Women in a later calendar, as ‘Feed the Birds’ is my favourite song in the whole film (I think it was also Walt Disney’s favourite song too, if I am not mistaken). P. L. Travers (b: 9 August 1899 – d: 23 April 1996) was an Australian-born British novelist and journalist.